Eggs- 4, plunged into boiling water for 5 minutes and then refreshed in cold water. Peel the cooked eggs, prick them all over with a fork and lightly salt them. Heat enough oil in a pan and fry the eggs until golden, flipping sides as and when required. Drain on paper towels and keep ready. Into a wok, tip in all the other ingredients and simmer for about 8 to 10 minutes or till the onions have become soft and the sauce has slightly thickened. Add the eggs and continue to cook for 5 more minutes. Season with enough salt, give a final stir and take it off the fire. 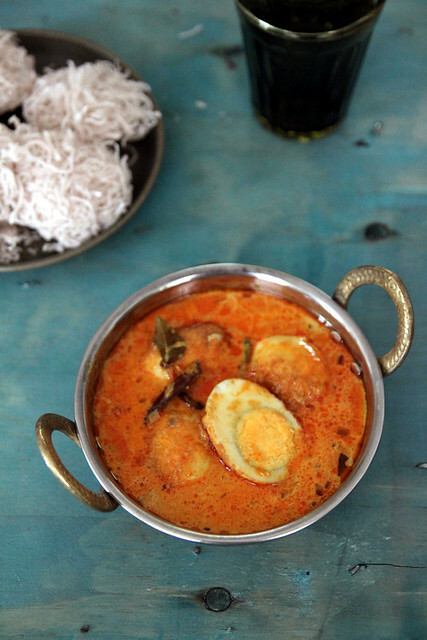 Serve with appam, idiyappam, roti or even bread.